The third try was the charm for the private Antares rocket, which launched into space from a new pad at NASA's Wallops Flight Facility, its twin engines roaring to life at 5 p.m. EDT (2100 GMT) on April 21, 2013 to carry a mock cargo ship out over the Atlantic Ocean and into orbit. The successful liftoff came after two delays caused by a minor mechanical glitch and bad weather. Orbital ATK's Antares rocket first launched into space on April 21, 2013, marking a leap forward for American commercial spaceflight. The unmanned Antares rocket blasted off from Virginia's Mid-Atlantic Regional Spaceport (MARS) located at NASA's Wallops Flight Facility, helping pave the way for eventual cargo missions to the International Space Station.At the time, Orbital had a $1.9 billion deal with NASA to fly eight unmanned supply missions using Antares and the company's robotic Cygnus spacecraft. 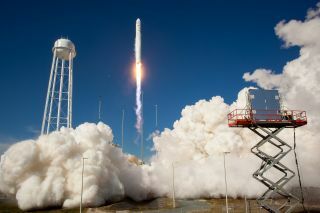 Since then, the company has received a new contract for more cargo launches to the space station using its Antares/Cygnus combo. The first version of Orbital ATK's Antares rocket use two Aerojet AJ26 rocket engines fueled by liquid oxygen and kerosene (RP-1) to power it's first stage. The AJ26 is based on the NK-33 engine, which was originally developed to launch Russia's giant N-1 moon rocket in the 1960s. N-1 was the Soviet answer to America's Saturn V rocket, used to launch astronauts to the moon during the space agency's Apollo program. The Soviet heavy-lifting rocket, however, was never launched successfully. On Oct. 28, 2014, however, an Antares rocket crashed and exploded during launch, and Orbital ATK traced the problem back to the AJ26 engines. The company has since replaced the engines with Russian-built RD-181 rocket engines. NASA's Wallops Flight Facility on Virginia's Eastern Shore has traditionally been a launching ground for small sounding rockets and high-altitude balloon missions, but Antares' missions from Pad-0A at the Mid-Atlantic Regional Spaceport (which is located at the Wallops facility) is helping broaden the site's scope. Engineers refurbished an old launch pad to accommodate Antares. Most big manned and unmanned American missions have historically been run from Florida's Cape Canaveral, including the space station cargo launches of Orbital ATK's competitor, SpaceX. Weather permitting, today's Antares launch could be seen as far south as Charleston, S.C. and as far north as Portland, Maine. The rocket should be visible as a bright streak of light in Washington, D.C., assuming clouds doesn't get in the way. The rocket's name comes from a long cosmic legacy. "Antares" is the name of a red supergiant star in the constellation Scorpius. It's one of the largest stars ever found, with a diameter several hundred times that of the sun. The star is about 600 light-years from Earth, and is among the top 20 brightest stars in the night sky. The Apollo Lunar Module used during the Apollo 14 mission was also named "Antares." The module brought a two-person crew down to the surface of the moon in 1971, making the "most precise landing to date," according to NASA reports. The company that developed Antares has also executed about 50 major launches for the U.S. Missile Defense Agency, the Air Force and the Navy to create a robust missile defense system in the United States. Orbital ATK creates target vehicles used in simulations to test the missile defense systems. The firm also manufactures "interceptor boosters" that can cut off possible missile launches aimed at the country. The Cygnus mass simulator on Antares's first test flight in April 2013 deployed a few tiny satellites for a commercial customer and NASA before burning up harmlessly in the Earth's atmosphere. The satellite payload included the Dove-1 nanosatellite for a commercial client and two versions of NASA Ames Research Center's Phonesats, which are about the size of a coffee cup.